YouTube vs Vimeo – Which is the Best Video Platform for You? So much of the internet is video. You can barely use a search engine without some part of the results being video. News articles are short on written copy and heavy on embedded video. And if you’re scrolling around any social media platform, your feed is likely saturated with video clips and snippets from TV shows or movies. Or cat videos…because cat videos. The point is that if you want to get noticed on the interwebs, video is your best bet. Not even considering production value and the technical aspects of video creation, probably the biggest decision you can make is where your video is going to live. In that regard, you only have two real choices. Your decision will come down to YouTube vs Vimeo, the two largest video only communities on the web. Note: Platforms like Facebook, Twitter, Instagram, and Snapchat are all technically other video destinations, but since they’re not video only platforms we’re not factoring them into this post. On the surface, the two platforms accomplish pretty much the the same thing. You make a video, you upload it to the platform, they host it, and people watch it. It’s pretty straightforward. Without a doubt, YouTube is the largest community on the internet (over 1 billion users). It has the second-highest traffic of any search engine, only losing out to good ole Google.com. Roughly everything you can think of has been uploaded to YouTube already, so there is no scarcity of content (or competition). Vimeo, on the other hand, doesn’t get nearly the traffic across the platform as YouTube, but their community is very tightly knit and generally positive (something that can’t be said about YouTube, we all know). The whole site from top to bottom is sleek and stylish, both in form and function. That’s totally in line with their overall business philosophy, too. So while YouTube has maybe 5x the traffic, Vimeo’s user-experience tends to be better overall. The TL;DR version is this: YouTube is video for the masses (all 1 billion of them). Vimeo is for a discerning viewer. But that’s just the high-level, top-down view. There’s a lot more to consider than just those generalizations. Whether you’re a creator or a viewer, YouTube is free. That goes right into what I was saying about video for the masses. Anyone can create an account and start uploading. You don’t get charged for storage, nor do you have to upgrade your creator account to a different tier to get access to options you may want or need–like live streaming. Everything is open to everyone from the beginning. Vimeo, on the other hand, takes a more traditional take on the pricing model. They are free to use as well, so you just have to sign up and start uploading. But their free tier comes with a couple of limitations. You get limited upload space (500mb per week, up to 25gb per year), basic stats (plays, finishes, comments, etc. ), and basic support (community help, not staff). When you upgrade, you get detailed analytics, staff help, and increased storage space–all of which is dependent on which plan you choose. Additionally, live streaming is a premium add-on service, regardless of your membership tier. On the opposite side of what you might have to pay, you have to consider how you’re going to get paid for your work. The differences between YouTube vs Vimeo in this respect are pretty drastic, honestly. At least for passive income. On YouTube, your primary source of revenue is advertising. We’ve all had to sit through pre-roll ads that play unbidden or mid-roll ads that obscure part of the video we’re really paying attention to. The downside is that you have to have 10,000 views on the channel to be eligible for ad revenue. The platform, however, doesn’t prohibit in-video advertising, paid videos, sponsorships, or anything like that. And then there is Patreon. Many creators on both sites rely on Patreon for the majority of their income. Patreon is a crowdfunding site that works like a subscription service. Your audience will pledge to support you for a certain amount on a regular basis, sometimes for extra perks you offer them. Patreon is platform agnostic, so it works outside of either YouTube or Patreon (even with WordPress!). You should know, that like every other monetization tactic for creative endeavors, you’re likely to see a decent return only if you have a sizeable audience already. Plus, you can combine this with either monetization option you chose that’s platform-specific, so that’s a big plus. As contradictory as it may sound, sometimes you just don’t want people to watch your videos. Whether it’s a training video for your team or a proof-of-concept or project for an art class, some stuff we make just isn’t ready or appropriate to hit the search engines. Both YouTube and Vimeo have decent-enough privacy options, though, just depending on what you need. YouTube gives you three options (four, if you count scheduled, which I don’t). 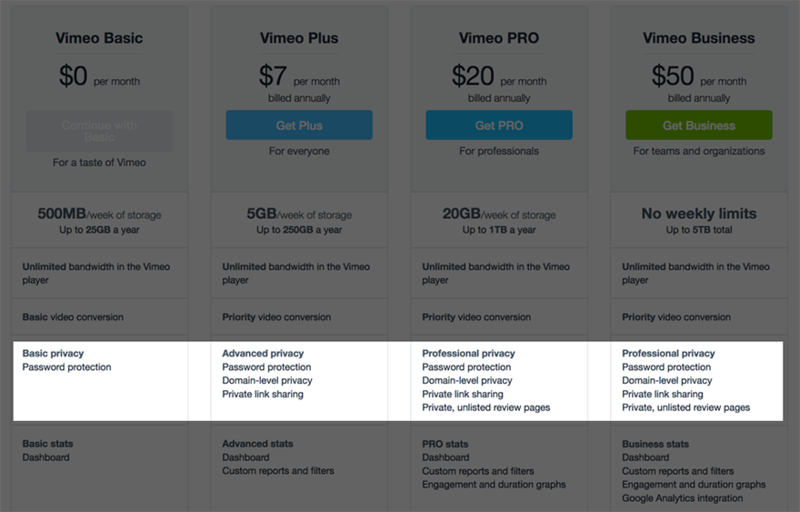 Vimeo, on the other hand, has (once again) tiers of privacy options, depending on how much you are paying per month. Paying for them is the downside, but on the other hand, you get a ton more options for whatever your situation might be. I am particularly fond of being able to password protect videos. There are two other major considerations you need to keep in mind when deciding between YouTube vs Vimeo. At the beginning of this post, I said that YouTube was for the masses, and Vimeo was for the discerning viewer. What I meant by that was that Vimeo isn’t necessarily a place where funny cat videos, vlogs, and how-tos flourish. Sure, you can put those online there, but the community is honestly more interested in creativity, the craft of film-making, and the art of it all. If you’re looking to build a brand around yourself, put out lots of videos with decent production values that people can find, watch, use, and maybe come back later, YouTube is your place. There’s a lot of turnaround from subscribers, the comments are…well…YouTube comments, and the focus tends to be more on you than on what you create. Vimeo, though, isn’t so much about you as a creator, it’s about the stuff you make. People will still know you, obviously, but they come to Vimeo to see short films and documentaries and more intellectually stimulating content. The turnaround may be lower, and you can build a community around topics and subjects more than yourself. In general, Vimeo creators put out fewer works than YouTube creators, but the audiences expect that and will come back whenever you have a new project. On YouTube, consistently and regularly putting out videos is pretty much necessary to retain viewers. Let’s be honest here: Google kind of rules what we see on the internet. Whether we want it to or not, we’re at the mercy of the big G’s algorithms, and not surprisingly, YouTube videos are prioritized in search results over Vimeo’s. It’s not fair, really, but it’s true. So if you’re primarily making videos that will get traffic from organic search, YouTube is probably going to be your best bet. Again, video for the masses. On the other hand, Vimeo is fantastic for directed traffic. Because of their video-on-demand structure and (subjectively) better player, you might be better off going with Vimeo if you have an established base that you’re providing consistent and high-quality video for (such as Patreon patrons or a membership site, especially with their increased privacy options). You’ll see far more organic, general traffic from YouTube. Likely even higher overall traffic, but there’s a good chance that the views and engagements you get on Vimeo will be higher quality interactions with more retention. The YouTube vs Vimeo choice, like everything else, is all about your goals and who you’re creating content for. The service seem similar on the surface, but they really aren’t. They can function similarly, but if you want to truly succeed with your videos, you shouldn’t see the decision as arbitrary. If you’re going to create a lot of videos that are aimed at the general public, plan on doing a lot of teaching or instructional videos, or live streaming, YouTube is probably going to be where you want your videos to live. It’s also the choice if you’re on a tighter budget. Vimeo, on the other hand, should get a good, long look if you’re working on longer-form projects that skew toward the creative side than the instructional or quick-fix. If you’ve got the budget for it, Vimeo can offer everything YouTube does (outside of Google search priority) in a pretty sleek package. Which platform do you prefer as either a user or creator? And why? Lord knows I don’t know everything or even much about this but it seems to me you missed the most important element. At least to me. At the end of YouTube videos you get all those links to other people and sites. One used to be able to eliminate those at no cost. I don’t think you can anymore. That makes for a sloppy, low-class presentation on your site or a clients. And it leads folks AWAY from your content. Never a good idea, free or not. That was the deciding element for me in biting the pay-to-host-my-video bullet. I totally agree. We never embed videos from YouTube; instead, we use YouTube to build audience and drive traffic to our site. It’s a one-way traffic. FYI – On YouTube there is an embed option where you can un-check “Show suggested videos when the video finishes.” It adds ?rel=0 at the end of the embed link. This may not be a reason to use YouTube, but it is helpful to know. We run an educational website so protecting our video content is essential. Amazon S3 was an option until we found Vimeo Pro. There is no bandwith limitation or charges; you only pay for the upload and the hosting. The greatest advantage in Vimeo Pro for us is that we can set the websites that are allowed to embed our videos. In our case it’s our own website but I can imagine this feature to be beneficial in affiliate marketing. Thanks for the article, good topic. Oh, wow. I wasn’t aware of that particular feature. So you can whitelist specific domains that can embed? That’s incredibly useful! There are new requirements to get monetized on Youtube. You need 4000 hours of views in last 12 months and 1000 subscribers. Even those who have monetized videos now will loose monetization. Great article though! Hands down for me it’s Vimeo. No forced branding. No forced ads. More professional looking. Better player. Their player is super slick. I am always happy when I see it, hah. Same with Wistia, though, but they don’t really market to the same crowds. Thanks for the comparison. I’ve been torn between the two for some time and while you laid out a good argument for both depending on use, I was very interested to read the other comments. I think I will look at Vimeo again. Let me know what you decide on. What kind of content do you create? YouTube still allows embed code that suppresses end-of-video suggestions. When used, your video displays the poster frame after it reaches the end. Also, for my videos, I always add about 20 seconds of black before rendering. That way, if people are watching on YouTube instead of one of my websites, they have time to scroll down to the Description and Comments rather than be distracted by suggestions right away. Hahaha! You sneaky, sneaky, man! Great article…but, there is a way to embbed an video from one or both this platforms with Divi? I mean, as a background. No, not currently, Max. The video will need to be hosted on your own server. 1. While I could always count on Vimeo playing videos stutter free, that’s not been the case as of late last year (I haven’t checked in the past couple of months to see if it’s improved). I wasn’t the only one who noticed this, as I was starting to see other post about it as well. 2. Wistia is an option, albeit an expensive one. I love Wistia. They have the best video tutorial content out there, personally. They have a strange place in terms of video SEO, though, because they don’t tend to show up as video-only results that often. I wish I knew why because their player is absolutely top-notch. They are expensive, though. I haven’t run into the Vimeo issues over the past year. Is it a player issue that might have been browser exclusive or something? I upload to both but only embed Vimeo on my sites and decide what I want them to see. Alink to a page to my site or specific videos. Lots of good comments here. Best of both worlds! That’s not a terrible idea, Don. Being able to embed the Vimeo vids is a great idea to avoid some of the video suggestions that come via YouTube at the end. Looked at YouTube, Vimeo, and Wistia. While you can view the video on Wistia, their primary purpose is to provide a platform for you to embed on your site. As they noted, do you want to drive traffic to YouTube, or to your own site? And, I like many of the features in Wistia: the easy email harvesting, the chapters, the player, the closed captions. Now, though, I have a choice to make, as to continue with Wistia is going to mean $100 a month, plus a small upcharge when we get past a certain number of videos. (Pretty much unlimited storage and bandwidth, though.) At this point in our startup’s life, I’m not sure I can afford $1,200 a year. So, once again, I’m looking at YouTube and Vimeo. I hate the ads in YouTube. I hate the “suggested videos” at the end. I hate the comment structure. On the other hand, when I searched Vimeo for news or political shows, I found almost nothing. I suspect that hosting on Vimeo will be like hosting on Wistia: the only traffic will be on our site, and we won’t get any growth from the hosting platform. But, of course, I don’t expect to get any growth back to our site from YouTube, either. And as far as I know, YouTube has no way to do email harvesting. Ugh all the way around. If anyone reading has actually seen traffic BACK to your web site from either of these platforms, I’d like to hear about it. I would be interested in that as well. I have seen nominal clicks on my channel’s links from YouTube. And as far as I know, there’s no email harvesting on YouTube since everything is handled by Google accounts. I couldn’t even find a way to message someone from a live stream the other week when I needed to speak afterward about a support issue–so that’s a very real concern. You are totally on target with the other comments, too. Wistia is very expensive and Vimeo is very insulated. YouTube might be the best bet if you’re looking for a news/political show and building a community around it, but the comments structure and suggestions are troubling for a lot of people. Folks up top did mention they had luck with turning off suggested videos in the Edit section of individual videos, though. So that might help. I like the distinction you pointed out, that YouTube is for personality, Vimeo is for information. This works well for my clients since they use video to improve the user experience for visitors to their sites — it’s not the main way they deliver content. So I’ve been fairly agnostic, leaning on technical differences for embedding. You’ve done a great job of explaining how the different platforms work for primary content producers too. Thanks! You’re quite welcome. I think it’s a neat idea to use Vimeo for learning content–I hadn’t even considered their restriction abilities in that way. You’re spot on with the player and embeds. Vimeo makes sure it’s a better experience. I know a lot of people use YouTube as a place for promo, such as trailers for podcasts and that kind of thing, while using private feeds or other platforms (like Patreon) to push out the content itself. It’s a neat idea to think of Vimeo in that way, too. Is Vimeo mobile friendly out-of-the-box? I want a full width video on a home page, which will also display correctly on a phone. I’m using a WordPress theme and the embedded YouTube video displays the way I want on the home page, but does not resize when viewed on a phone.